The influx of computer technology into classrooms during the past decade raises the questions -- how can we teach children to use computers productively and what effect will learning to program computers have on them? During this same period, researchers have investigated novice learning of computer programming. 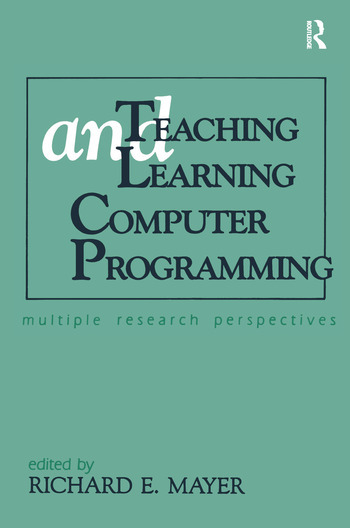 Teaching and Learning Computer Programming unites papers and perspectives by respected researchers of teaching and learning computer science while it summarizes and integrates major theoretical and empirical contributions. It gives a current and concise account of how instructional techniques affect student learning and how learning of programming affects students' cognitive skills. This collection is an ideal supplementary text for students and a valuable reference for professionals and researchers of education, technology and psychology, computer science, communication, developmental psychology, and industrial organization. Contents: R.E. Mayer, Introduction to Research on Teaching and Learning Computer Programming. D.H. Clements, S. Merriman, Componential Developments in LOGO Programming Environments. A.L. Fay, R.E. Mayer, Learning LOGO: A Cognitive Analysis. R. Lehrer, T. Guckenberg, L. Sancilio, Influences of LOGO on Children's Intellectual Development. J. Littlefield, V. Delclos, S. Lever, K.N. Clayton, J. Bransford, J.J. Franks, Learning LOGO: Method of Teaching, Transfer of General Skills, and Attitudes Toward Computers. E. Soloway, J. Spohrer, D. Littman, E UNUM PLURIBUS: Generating Alternative Designs. D.N. Perkins, S. Schwartz, R. Simmons, Instructional Strategies for the Problems of Novice Programmers. N.M. Webb, S. Lewis, The Social Context of Learning Computer Programming. K.D. Sloane, M.C. Linn, Instructional Conditions in Pascal Programming Classes. D. Sleeman, R.T. Putnam, J. Baxter, L. Kuspa, An Introductory Pascal Class: A Case Study of Students' Errors. S. McCoy Carver, Learning and Transfer of Debugging Skills: Applying Task Analysis to Curriculum Design and Assessment. R.H. Seidman, New Directions in Educational Computing Research. "Perhaps the most important contribution of collected works such as this is the variety of approaches that they embody. Students and researchers in educational psychology should find this a rich source of ideas about how to address the complex issues of their domain."